Be a one-person band with the ability to make drum beats on the fly. 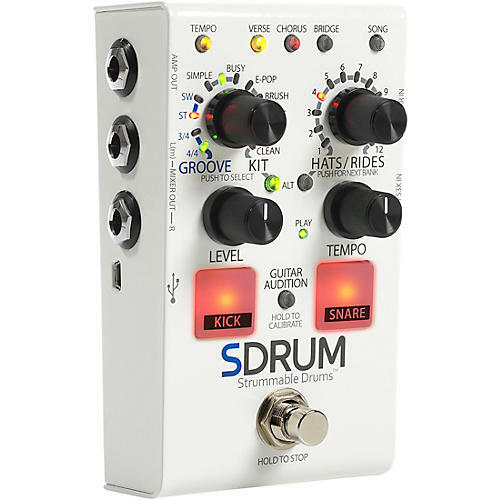 The DigiTech SDRUM pedal is your own personal drummer, always ready to learn a new song. Think of a groove, grab your guitar, scratch out a bar or two, and DigiTech's BeatScratch technology will build a full drum accompaniment based on what you played. You’ll get a verse and chorus automatically, making it simple to perform complete songs using the footswitch to control playback. You can even add a bridge part, change kits or try out countless pattern variations that never stray from your basic groove. Stop searching. Stop programming. Just play.